Designed to Illustrate the Philosophy of Human Nature. St. Louis, MO. Publisher: T.W. Ustick, printer. Editor: T.J. M'Nair. 1/1, May 1, 1845-1849. 24 pp. $1.00 a copy, or six copies for $5.00. Magnetism and hypnotism. Important early midwestern occult periodical, notable for early coverage of (Andrew) Jackson Davis, the marvelous illiterate boy clairvoyant (at the time), as well as for coverage of early Joseph Rodes Buchanan doings, and early (anonymous) E. A. Hitchcock material. 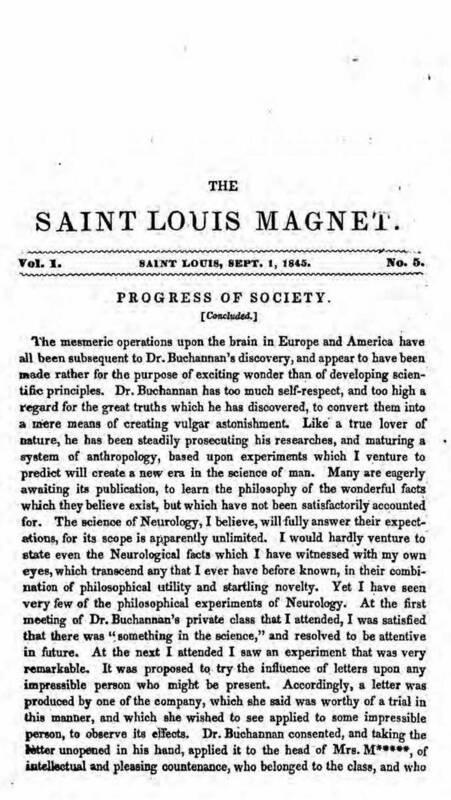 St. Louis is an important US occult center in the 19th century, and this is one of the earliest periodicals issued from St. Louis.